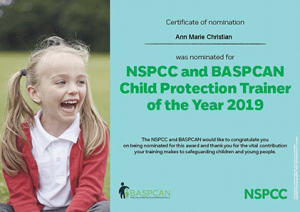 Ann Marie is an accredited NSPCC trainer as well as a Safer Recruitment trainer accredited by the Department for Education. We have worked with front line child protection for over twenty years and have specialised in education setting for the last seventeen years. 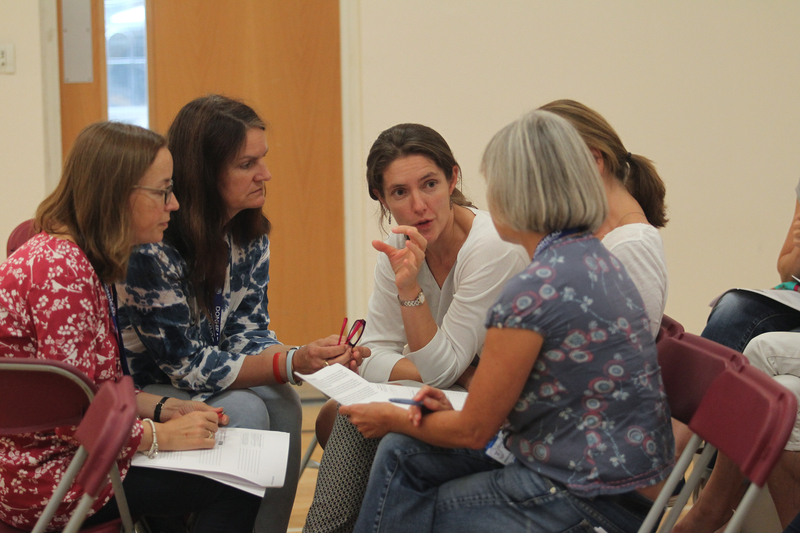 We work nationally and internationally as well as providing in-house training to all child care settings. We receive a large number of very positive delegate recommendations and we are proud that recommendations come via word of mouth from satisfied colleagues. Independent investigations post LADO referrals, parent complaints etc. At the moment Ann Marie offers two training courses; Designated Safeguarding Lead and Safer Recruitment Training. You will find more details about both courses by clicking on the links below. "Thank you. This was outstanding training"
"Thank you Ann Marie. This has been a great session. I look forward to working with you in the future"
"Some very useful information. Thank you"
"I will now discuss any concern with DSL not teacher. Thank you"
"Very informative. 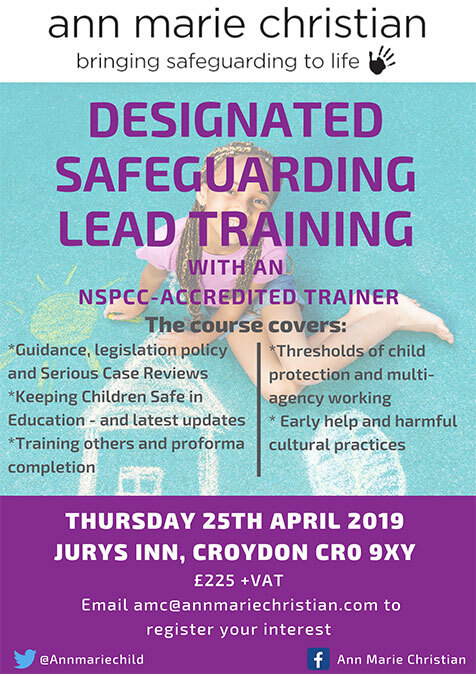 Excellent examples of case studies used"
"Good to have real case studies"
"Case studies cited were very useful"
"As a result, I propose to be more vigilant about child protection concerns"
"I will be more pro-active, question situations"
"A very interesting course. The course materials were great". "Clearly set out and explained. Good role playing used to clarify issues". "Really worthwhile and helpful. Thank you so much. An excellent day"
"Very interesting and thought provoking training"
"Extremely useful training and something .we will be looking to repeat as a DSL team. Thank you Ann Marie"
"The trainer was eloquent and understanding to my training needs"
"Well paced and good to have small delegate group to enable discussion and questions"
"Really informative and well provided"
"A very informative session with relevant resources and set at a good pace"
"Really focused on our needs as an independent boarding school in West Sussex. Thank you Ann Marie"
"Very good presentation and use of discussion"
"I thought Ann Marie gave us a very clear set of guidelines to work to"
"Ann Marie was very thorough and presented well"
"A very good reminder that CP is serious and how to act upon any CP related concern you might have as a practitioner"
"Very clear thank you for all the information"
"This was a much more in depth training from last time keeping in par with the new safeguarding policy. Thank you"
"Really good refresher. Thank you"
Ann Marie is a very knowledgeable trainer, who is passionate about her subject. Her training is up to date; relevant; clear and concise. She has a good sense of humour, which has proved invaluable. Her training events are always well received by delegates. A valued member of the team at PBM. Ann Marie provided a bespoke Child Protection training package for our company and had the flexibility and experience to tailor the materials and content to the rather specific needs of our members. I was very pleased with her ability to focus on the individual not an easy task in such a diverse group of school staff. In short - a good effort and good value.